Will BlackBerry Stop Making Its Own Devices? License OS? Become Service? Tuesday, BlackBerry CEO Thorsten Heins announced that BlackBerry Messenger will be available on Android and iOS later this Summer. Additionally, BlackBerry rolled out an update to its BlackBerry Enterprise Service that further makes its embedded enterprises services more compatible with Android and iOS devices. So that begs the question, “why would anyone need to buy a BlackBerry device?” Leverage that BlackBerry has held over its competition has been BBM and its secure, reliable, and regulatory compliant services. BlackBerry has just handed away its most coveted assets. These features were the reasons people bought BlackBerry devices. My initial thought is that BlackBerry is transitioning its business from an all inclusive hardware and software company to be more of a service business. Like IBM had transitioned years ago from a hardware company to what is now essentially an IT servicing/consulting business. HP too is trying to shed its PC and printer business and focus more on consulting services. Recent years have been painful for the Canadian company, shutting down numerous factories, fleeing subscribers, multiple delays on BlackBerry 10. The only saving grace was its paying subscriber base that essentially floated BlackBerry financially. Could it be possible that someone convinced Thorsten Heins the existing business model was too competitive and albeit too risky for a company to phonemaker, OS developer and server provider? 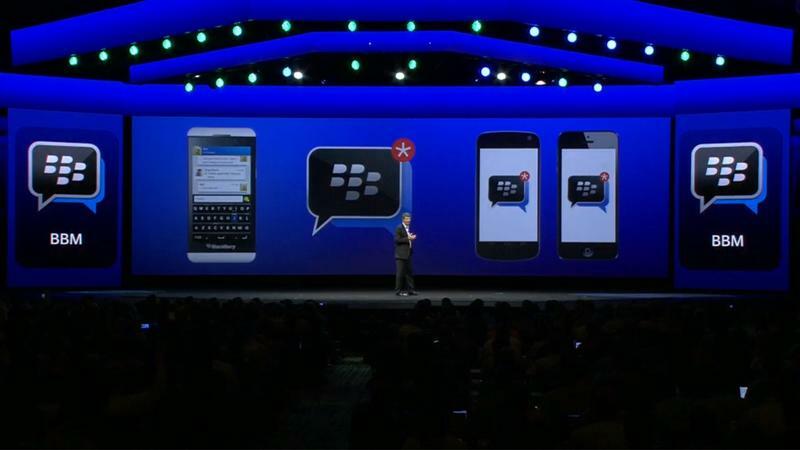 BlackBerry today gave away one of its crown jewels, BlackBerry Messenger. If this were 2005-2008, I would say BlackBerry gave up its most valued asset, except BBM isn’t as popular as it once was. With a plethora of messaging apps and services like iMessage offering similar features, BBM is all but obsolete in the eyes of most consumers. If anything BBM will now have a chance as a useful messaging service with access to over a billion users (combined Android and iOS users). BES 10 as a service made it easier to bring Android and iOS devices on to existing enterprise servers. IT Managers rejoice! In the coming months, a new app will deliver BES services to iOS and Android devices in more BlackBerry like fashion. What that looks and feels like has not yet been confirmed, but it shows BlackBerry’s willingness to explore use of BB products and services outside of its own devices. It doesn’t hurt BlackBerry that they can pocket $59 per user annually for BES services on devices they don’t even make. Would BlackBerry go as far as licensing its BB10 operating system? It would seem plausible now more than ever. Does that mean we’ve seen the last of BlackBerry devices? At least for now, it seems you’ll be safe with your Z10. But, BlackBerry needs to make money somewhere. Ultimately, BlackBerry’s management must decide where money is to be made. Hardware, Software, Services? Currently BlackBerry offers all three in one package. Starting this summer, it will make a more active approach offering them as individual offerings. It doesn’t seem too far-fetched to see BlackBerry license its OS to manufacturers, or even a BlackBerry shell on Android, like those found on Kindle Fire or FaceBook First/Home. It’s not entirely too crazy of a thought, especially if BlackBerry’s Service is embedded on the backend. Users would get the look and feel of BB10, but still have access to BBM and all other BlackBerry services. Plus, last time I checked, not many people were clamoring for BlackBerry as their favorite operating system. However, where my BB Skin Android App theory falls flat is how BlackBerry would generate revenue, it would have to come in the form of a paid app, or subscription service. Then again, BlackBerry could skip the Android Skin all together and license their OS to a variety of developers and adopt an Android or Windows Phone-like ecosystem and collect revenues through manufacturers and App sales. These ideas are entirely speculative and by no means do I present this information as facts. But its clear that BlackBerry is changing its business model, and I wouldn’t rule out a shift in its current business practice, especially if it doesn’t see a drastic improvement.